Traveling along the ancient Silk Road to indulge in the enchanting world with spectacular natural scenery, glorious historical and cultural relics, and exotic ethnic culture and customs! From Xian that has the world-famous Terracotta Warriors and Horses to Dunhuang where finds the superb frescos at Mogao Caves, to continue to Xinjiang where to see the intriguing Heavenly Lake around Urumqi, meet Turpan with Jiaohe Ruins, and wonder at Kashagar in its Sunday Bazaar where you can almost buy everything, the mystic Silk Road awaits you with its numerous fantasy and spectacles. 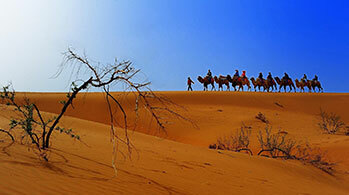 The Silk Road is an ancient and historically important overland trade route. Opened up during the Han dynasty (206 BC – 220 AD) by General Zhang Qiang, the Silk Road has a history of more than 2,000 years. Originating from the ancient capital Changan (now Xian) and extending about 7,000 kilometers, the Silk Road threads all the way through provinces of Shaanxi, Gansu, Ningxia, Qinghai, and Xinjiang to the central Asia and as far as the Mediterranean area. Silk Road derived its name because silk was the major and also the most significant trade product along this trade road. Today, the Silk Road still attracts people charms tourists there for its awe-inspiring historic relics and fabulous landscapes. Apart from commodity trade to promote the economic development of both China and countries along the road, but more importantly the Silk Road has made great contribution to the cultural exchange between the China and the west in the aspects of culture, art, religion, and technology. During the process of economic and political exchange, religions of the West were introduced into China through Silk Road including Buddhism, Islam, Zoroastrianism, Manicheism, and Nestorianism. These religions were introduced into China accompanying their religious arts and had profound effect on religious and spiritual beliefs in China. Today those many awe-inspiring temples and mosques along the Silk Road are great cultural treasures left. Cultural exchange through Silk Road is also illustrated in technology. The Chinese Four Great Inventions, together with skills of silk weaving, silkworms breeding, and China’s great achievements in astronomy, medicine, literature, music and painting were also introduced to the west and had greatly promoted the development of the world. At the same time, acrobatics, music, dance, fashion, and cooking of the West Asia and Central Asia were spread into China and had a profound effect on China especially on the ethnic minorities like Uygur and Hui. Besides the spectacular sights and inspiring historical relics, Silk Road also prepares abundant featured tasty food and dishes for tourists. Though dishes made with flour, beef and mutton are the most commonly seen along the Silk Road, food varies in flavors from city to city. Xian probably has the most selections of food along the Silk Road. Famous dishes which should not miss out include Saoxi Noodle, Roujiamo, Pita Bread Soaked in Lamb Soup, Cold Noodles, Dumplings, and Biangbiang Noodle. When traveling to Xinjiang, delicious dishes like Kebabs, Roasted Mutton Chops, Nang, Big Plate Chicken, Roasted Stuffed Buns, Milk Tea, and Yogurt are the must-try. 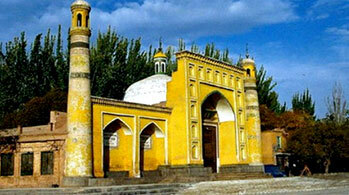 What’s more, do not miss the chance for getting a feast of fresh fruits when travel to Turpan and Kashgar.